Because you’ve already set up an iTunes Store account (if you haven’t done so yet, do that first! ), when you choose to buy an item, it’s automatically charged to the credit card or PayPal account you have on record or against any allowance you have outstanding from an iTunes gift card. However, you might just want to preview an item before you buy it to be sure it’s a good fit. 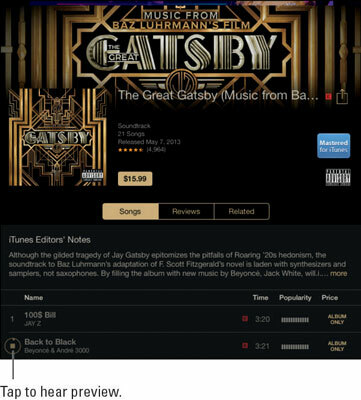 If you like it, buying and downloading are then easy and quick. 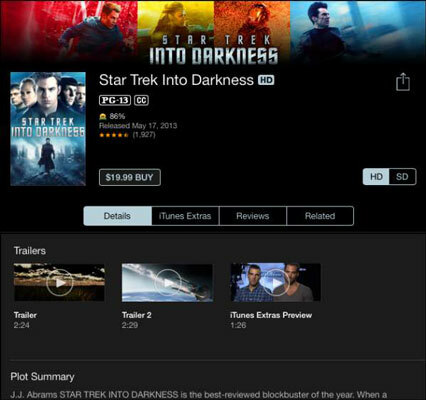 Open iTunes Store and locate a selection you might want to buy using any method. Tap the item to see detailed information about it, as shown in this figure. For a movie or audiobook selection, tap the Trailer button (refer to the figure) to play a preview. For a TV show, tap an episode to get further information. If you want to listen to a sample of a music selection, tap the track number or name of a selection with a red preview icon to the right of it, as shown in this figure. If you like what you hear or see, you’re ready to buy.